miss_s_b | Lib Dem Leadership - the runners and riders. With added Star Trek metaphor! Is UKIP here to stay as a serious player? Slightly changing tack now. In Spring 2011 in a speech about social mobility you used the phrase “Birth should never be destiny” which I completely agree with. But how can you reconcile this with your support for an hereditary monarchy? I just don’t believe for a minute that if you were to man the barricades and effect a revolution to turn the United Kingdom from a monarchy into a republic, suddenly the problems of poor housing, poor infant health, poor pre-school support, poor education for poor children in primary schools would suddenly be solved. I think it’s the wrong answer to a much more profound social problem which is bound up with our education system, housing and patterns of work. I just happen to think that the monarchy provides a sense of identity and clearly brings a great sense of sort of value and pride to the country. I think it unites people, and we want to unite people rather than divide them. I don’t think the monarchy in and of itself is why we have these huge social and economic forces and factors that prejudice the lives of children who are born into poor backgrounds. I think what is be slightly different which may be what you’re after is: “Does it foster a culture of diffidence and hierarchy?”. I personally think Britain is not a particularly diffident or hierarchical society, I mean people just don’t take authority no questions asked any more. I was going to phrase it slightly differently than diffidence. I was going to ask isn’t it true that because our head of state is there by virtue of birth rather than merit that it undermines the case at a fundamental level within our society for meritocracy which is something that as liberals we should be striving more for? …and I am aware that there is a big majority in the country currently in favour of the monarchy so I realise that this is a rather academic discussion. Yes, and I personally, not least now that I actually have more contact with members of the Royal family have actually become a stronger supporter of the monarchy than I even was before. So were you already a strong supporter of the monarchy? …I understand the point you’re making but don’t you think like for example in the US where any child could potentially become the President and the Head of State that that says something fundamental about that society and how it operates? …I don’t normally wear a suit. I wore it especially for you Nick! Well I’m flattered Mark! But a political class who are not representative of modern diverse Britain. That is a much more urgent problem we should be addressing it seems to me than reopening a debate that the British people don’t want us to reopen and that I genuinely don’t think has the direct effect on lack of meritocracy that you feel. I hear what you say but I don’t share that view. OK. So my last two questions. They are both related. Politics is a rough old game and there is often bad blood between politicians and leaders of different parties. So to combat that can you list three things that you like about Ed Miliband? …and is he willing to engage in sensible debate because you don’t always get that from for example PMQs? But PMQs is not a debate, it’s a shouting match! He’s got a perfectly good sense of humour. He’s a civilised human being. I’ve talked to him on several occasions and I have found him easy to talk to. He’s wrong though! But that’s a different matter. Linked to this do you think that PMQs and politics in general might benefit from a change in approach? A friend of mine recently suggested that you could still have PMQs but once a week the Prime Minister and Leader of the Opposition sit in a room with a moderator and for half an hour or three quarters of an hour just debate policy. Without all the baying and the jeering and the “playing for your team”. Do you think politics might benefit from something like that? Look, I’ve been through this myself. The problem that we have at the moment is that if you act in a thoughtful, considered, emollient, human manner in the bear-pit of politics whether that’s on the floor of the House of Commons or some moderated discussion what I’ve discovered is that people immediately brand that as weak and ineffective. I mean I saw it myself in the first few months of this government. When I did Deputy PMQs or stood in for PMQs I tried a kind of… I mean sometimes I didn’t, sometimes I’d lose it and shout at the Labour benches but you know if I was to sort of engage then it would be written up the following day as “Oh, he’s weak, he’s rubbish” all the rest of it. If I got up and just yelled at the other side, said a few jokes, made them look ridiculous and beat them round the head and neck it would be “Oh, a good strong improved performance”. I’m afraid that there’s this remorseless logic at the moment for the way in the which politics is communicated, interpreted and mediated by the press which just constantly ramps up the antagonism. It doesn’t mean that politicians can’t speak to each other but I wouldn’t hold your breath that there’s a new public forum. Much that I would like the idea that politicians could have a sort of fireside chat. At the moment, funnily enough particularly at the moment I think there is a rather shrill, almost semi-hysterical tone which is entering into the coverage of politics in part of our press. I think it’s partly because the press themselves are quite anxious about how they are going to hold onto their own readers so they are becoming ever more hyperbolic in order to try and hold onto people. I have followed Jo Swinson's career with interest. 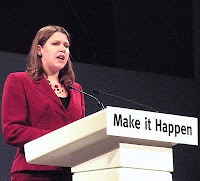 Until recently she was PPS to Nick Clegg and she was recently promoted to minister for employment and equality. She is always keen to talk with activists and others on Twitter. She is relentlessly polite and engaging on issues and having observed her speaking at a number of fringe events over the years is an excellent public speaker in that sort of forum. But where I have noticed her potential most of all is how she handles the much bigger stage in the main conference hall. She always appears to effortlessly have full mastery of her brief, whatever it may be and has a very persuasive manner. A good example was today during the "Generating jobs and growth in a time of austerity" debate which she summated. She very deftly handled the task of pulling together the strands of what everyone else had said as well as gently but firmly explaining why she thought an amendment that had been moved to try and change the nature of the motion was not in her view the right way to go. In fact there was a flash of steel at one point where she essentially described it as crazy albeit by utilising the device of quoting what Tim Farron had actually said about something else entirely. But there was no mistaking what she meant. I was actually reminded a little bit of a young Tony Blair. Jo certainly has a lot of political charisma and it could take her a long, long way. I was going to say in this post that she might be in contention to be "the next party leader but one". But on further reflection, I see no reason why she should not go for it the next time there is a vacancy. Cable and Farron will be the obvious runners but an insurgent campaign from the MP for East Dunbartonshire could yield great dividends. There will be lots of opportunity for her to demonstrate her political and debating skills during a leadership contest and I suspect that many party members will, like myself find their respect for her as a candidate increase the more they see of her. I don't expect there to be a vacancy for a while (as I have repeatedly said to various radio stations in the last few days here at conference!) but when there eventually is, I would urge Jo to go for it. If we could start with a question kind of about the future but a little bit about the past too. With Lords reform now dead, what will be the coalition’s historic legacy do you think? Oh I think the coalition’s historic legacy will be, firstly being a coalition! For those of us like you and I who are interested in politics being done differently and moving our sclerotic political culture forward, don’t forget that showing people multi-party politics works and that you don’t always just have to have either the blue team or the red team in charge is arguably more important than any one piece of legislation in terms of advancing the kind of politics that we believe in. Plural, evidence based, reasonable, where people set aside their differences in the national interest. I think that is massive and I don’t think that can be exaggerated. I think sometimes as Liberal Democrats we need to remind ourselves that however much people might be irritated by the antics of the Tory right and however much we might want to govern on our own actually proving that coalition works remains a massive strategic priority. And you know there are other things we are doing to change politics. The Fixed Term Parliament Bill which I think sometimes people assume that that’s just a small little ball; it’s not, it’s quite a big thing. We’ve been campaigning on that for generations and that actually changes politics quite significantly. I do think as a legacy we will have proved that politics can be done differently. That’s the first thing. The second big thing is that we will be the government that has had to cope with the fallout of the biggest economic crisis this country has arguably faced for decades. I don’t think it is possible to exaggerate quite how serious this implosion was in the heart of our economy back in 2008. It’s not any old recession, I mean that was a complete breakdown, a sort of seizure in the heart, in the kind of transmission mechanism of our country, our capitalist system. Vince Cable has described it as being like a heart attack. The idea that you can recover from a heart attack of that severity with one policy or one wave of the magic wand. I think history will judge us very kindly in that if we hadn’t stepped up to the plate to provide a government that could pull us back from the precipice, which is where we were teetering back in 2010. If we can show by 2015, not that we’ve sorted everything out but that we have basically pointed the economy… by the way not simply putting Humpty Dumpty back together again, but actually rewiring the economy on a different basis, I think we will have done a great thing because we will have not only fixed the problem but we will have learnt the lessons from the past. By the way this agenda includes really, really building on green growth and not having this ludicrous stand-off between people who say you have to have growth and those who say you have to go green as if the two things are separate. They’re not. They go hand in hand. And the third big thing for me is to make sure we don’t only repair the economy but that we also at the same time seek to unblock society to make it fairer in the very specific sense of giving people the opportunity to get ahead, live out their dreams and fulfil their talents. A liberal view of life is not one which wants to flatten and homogenise people but which wants to release potential in each and every individual. That’s why I place such emphasis on tax reforms so that people on low pay can keep more money. On our early years reforms so that two and three and four year olds get more support than they have ever done before. On the pupil premium, on making sure that we cherish vocational education just as much as university education. These are things which you would struggle to put some of it on a leaflet by 2015 but is what I think liberalism is all about. We live in a highly segregated society where privilege communicates itself across generations and where disadvantage does as well. Much more than in other liberally democratic developed nations. So those are really the three things: changing politics for the good, fixing the economy but rewiring it for good and creating a really rich sense of fairness about how society works. Just picking up that final point in the context of the announcement about the potential partial funding of mortgages from people’s parent’s and grandparent’s pensions which you made yesterday. Some people have been talking about it and I was just asked to discuss it on the radio. The question I’ve been asked and I am wondering myself is, isn’t this only going to help rich families basically? How is this progressive and how is it going to help poorer people? Firstly you’re quite right that it doesn’t help everybody. It only helps those people who have got assets in pension pots which they can mobilise as a lump sum to offer as a guarantee to mortgage lenders so that your child or grandchild can take out a deposit. So it’s unashamedly for people with that asset. People who have got a £40,000 pension pot but have got very little disposable income, they don’t feel very rich. They may have very little in their current account and by no stretch of the imagination could they be called rich, yet they are people if you like in the middle or even low-to-middle income bracket who just so happen to have this pension pot which they wish to mobilise for the benefit of their children. So it’s not for everybody, you’re quite right. It is for people who have got a particular asset in the form of a pension pot. So it that sense it’s not for everybody. But it helps a set of people. The rough calculations from Steve Webb are that it could be made available to around 250,000 people in this country. Clearly not all of them will do it, but even if a small proportion do that’s still helping thousands and thousands of youngsters and helping them get a home that they otherwise wouldn’t get. It’s not a catch-all solution. So you see it as part of a basket of measures to help? I know there are lots of other things being done as well but particularly when it comes to helping people get a house, or get a residence (it doesn’t always have to be a house). I used to rent for many years actually and one time I just had to get out of my house within two months because the landlord decided he wanted to let it to his son. I had no real security of tenure beyond a couple of months, I had to go. It was very frustrating and I just wonder what measures you think would be appropriate to help in that area. I think what we need, above all frankly is more homes. More affordable homes, more social homes and more private homes for rent. There are a lot of people in the lower income bracket, not the lowest who rely increasingly on private rented accommodation and that’s why, much though all the press coverage of the announcements I and the Prime Minister made recently about the housing package were all about the temporary removal of the restrictions on extending your conservatory. Actually by far the biggest thing, something that’s never happened before which is that we broke the taboo in the treasury that says “Oooh, you can’t use the government’s balance sheet to offer as a sort of insurance policy” we offered £10 billion worth of guarantees to the registered social landlords and the house-builders who build housing for private rent. And they are telling us that this is going to be a massive shot in the arm for the provision of housing that you say people rely upon. Particularly those people who can’t get onto the property ladder as owners outright, or are often in transition in their professional or family life. I wanted to ask you about perhaps a slightly controversial issue, drugs policy. Barack Obama recently said that drugs policy “is a legitimate topic for debate”. I think sometimes in the US it’s closed down as an issue but he’s clearly receptive to it. David Cameron himself called for a debate on legalisation of drugs 10 years ago when he was part of a select committee and signed up to the report that said that. There are also serious moves taking place in Latin America along these lines, I’m sure you’re aware of them. The world is moving on so is it possible that the coalition could do something on this issue? Could perhaps make some changes in a direction that would help reduce harms caused by drugs? Do you think that this government is receptive to that though? Well I was going to come to that. I actually think that if you look at what we’re doing as a government in the drugs strategy, published in the first few months of the government’s life… Would it be the drugs strategy that a Liberal Democrat would write? Probably not but there is a lot in there, particularly on remedial support for people who have long term drug addictions which is very, very promising indeed. If you listen to the stuff that Ken Clarke was promoting as Justice Secretary and even Chris Grayling with his reputation for a being a “hard man of the right” actually I think there is now a cross-party consensus that we cannot simply carry on warehousing people in our prisons who have very serious mental health or drug conditions and not deal with those conditions themselves. So I think that’s a change. However, do I think there might be a case to look at this again? Well of course you’ve got to look at this, over and over again. We don’t have the answer to something which is a scourge in society. But even measures like for example changing the categorisation of cannabis which was moved from B to C and then back to B. Cannabis is widely perceived as being a lot less harmful than something like alcohol. The fact that this government, and not just this government, every government for many decades seems to largely ignore the evidence on this issue. Do you think there is any possibility of the government moving in a more progressive direction on something like cannabis? Just to put it into context as well there was a recent study that demonstrated fairly unequivocally that children under the age of 18 can seriously damage the development of their brains. But after the age of 18, there isn’t really that risk there. I’m not saying there is not risk with cannabis after 18 but that particular one is not there. So I thought it might be more appropriate to legalise cannabis but make it so that children cannot get hold of it in the same way as currently with alcohol, rigorously enforce that and therefore send a message that is evidence based regarding that particular drug. The drugs laws at the moment are not taken very seriously by some, perhaps because they’re not based very much in evidence, you know “All drugs are as bad as each other”. People know that is not true. Basically I agree with your assumption that politicians should, in as much as it is possible for politicians to do this, refrain from seeking to make unilateral decisions, which of course need to be informed by what the Advisory Council on the Misuse of Drugs say, and what the police say and others. That’s certainly a principle that, I’m not going to pretend is always met in practise but is certainly one that I am personally very committed to. The second thing I would say is that you are quite right, there are an increasing number of bodies who are revisiting this debate in the round. So for instance the Home Affairs Select Committee has been looking at this now for a long time and I think is due to report in December. I will be reading that very, very closely indeed. If a cross-party select committee revisits some of these issues and urges us to open them up as a government, I think the onus is on us, not them to explain why we shouldn’t. Because every time people look at this issue on a cross-party basis in a considered fashion, it seems to me over several years now including in the committee that David Cameron once sat, actually the advice is for radical action towards a more evidence based approach. I will look out for what the HASC has with quite an open mind. You may not be able to answer this question because I am sure you can’t read David Cameron’s mind but do you think that he would be receptive to such a debate? He certainly seemed to be 10 years ago and I wonder what’s changed. I’ve no idea. I haven’t talked to him about it. I strongly suspect the Conservative Party as it has been for a long time is quite divided on this issue. You do have a liberal wing in the Conservative Party that is actually quite thoughtful and liberal and not hidebound by prejudice or fear of the Daily Mail headlines which is prepared to be free-thinking about this, driven by the evidence. Then you have another wing of the Conservative Party which you know, just wants to grab the headlines and appear tough even if it doesn’t actually help youngsters who are addicted and it doesn’t actually help reduce crime. Like so many things in the Conservative Party, there is this constant battle for its soul. We are lucky enough that we operate in the Liberal Democrats on this issue from a pretty calm, considered, reasonable and evidence based approach. 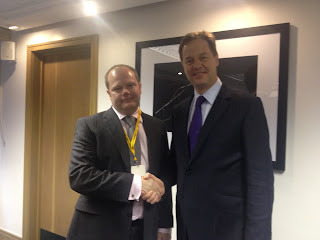 Tomorrow I will post the remainder of my interview with Nick including a discussion on how his speech last year that stated "Birth should never be destiny" can be reconciled with his support for an hereditary Monarchy, the three things he likes about Ed Miliband and whether anything can be done to improve Prime Minister's Questions! You can now read the second part of the interview here. Lib Dem Blog of the Year! I was very surprised and honoured to win the Lib Dem Blog of the Year award at the BOTYs held here in Brighton last night. I have only been blogging on and off in the last year for family reasons that regular readers will know about but I have dipped in and out with my thoughts/rants as and when I have felt that I have something to say. It means a lot to me that people have nominated this blog and I would also like to thank the judges. The other shortlisted blogs in this category were Caron’s Musings by Caron Lindsay, The Ramblings of Neil Monnery by Neil Monnery and A View from Ham Common by Richard Morris, all of which I regularly read and and enjoy and any of whom would have been worthy winners. 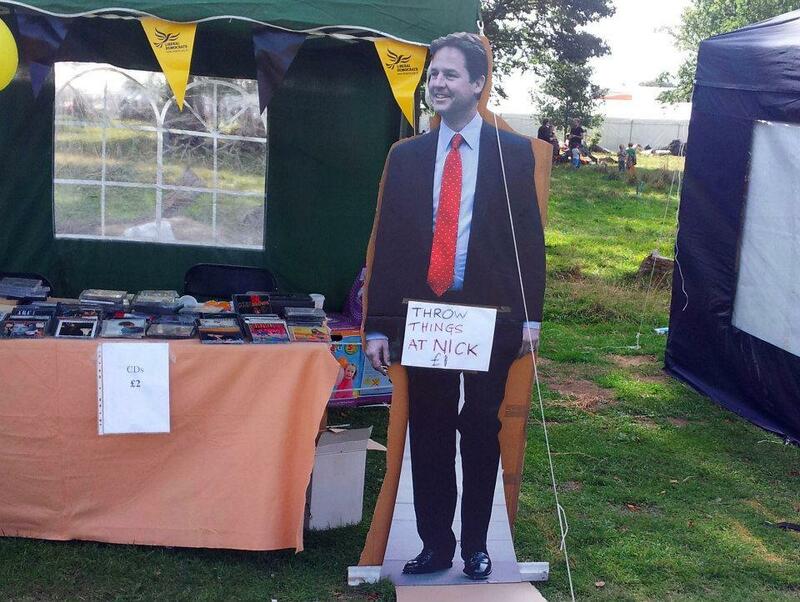 My prize is a 25 minute one on one interview with Nick Clegg tomorrow. Hopefully I can think of some insightful questions to ask him. Feel free to make suggestions! Andrew Mitchell's sense of entitlement is truly shocking – Telegraph Blogs - Surely he'll be out before the end of the weekend? The amount of time and effort that must have gone into this massive scrollable xkcd picture is incredible - Good way to waste half an hour! Death by regulation: the EU ban on low-risk oral tobacco « Clive Bates blog - Another example of making the less bad the enemy of the worst? UK government is squatting on 1.67 million unused IPv4 addresses - Not sure about the maths here. Can each individual IP address really be worth nearly $100? If Toynbee's rhetoric today was actually true wouldn't we essentially be living in a fascist state? - Polly goes way over the top. I'm not sure she's giving herself any further hyperbole headroom for if we ever have a Tory majority government again. As much as I agree with Peter Reynolds' comments here, it is surely not the place of the police to make political statements? But they oppose absolutely everything the government does. Everything. Even the things that were in their own manifesto. Or if they can't find a way to directly oppose it (because they agree with it) it's "the wrong time" or "it's too fast" or "too slow". In some ways it reminds me of a jaded spouse who constantly niggles away trying to undermine their partner, scoring petty points for slights either real or imagined that have long since been forgotten by everyone except them. This matters. It matters because this is the sort of thing that really turns people off politics. All they ever hear are politicians having a go at each other, slagging each other off and pretending that they, and only they have all the right answers (and their opponents are wrong about everything). It also matters because it helps to polarise the debate. There are two and only two views. The government and the opposition. The plethora of nuance rarely gets a look-in when the tub-thumpers with their bully-pulpits are in full throated voice. It's also turning me off. I very rarely read opinion pieces by front-bench spokespeople of any party these days. There's not really any point. They just parrot the party line accentuating the good in their proposals and the bad in their opponents. People who were really interesting to read before they were front-line politicians like Michael Gove, David Willetts, Ed Miliband and Nick Clegg have to play this game. It's a silly, silly game. When Stephen Twigg responded to the government's proposals on examinations yesterday I knew exactly what he was going to say. Of course there are some problems with the government's proposals. There were reasons why we changed from O-Levels to GCSEs in 1988 and some of the old problems still apply. But there is some merit in them too. It is far too easy to cheat on coursework these days and the changes will attempt to address that problem. There are also long overdue attempts to address grade-inflation. But Twigg just attacked, and attacked and attacked. I've met Stephen Twigg. He's a nice, moderate sort of chap. But he too has to play this game. The government are wrong, wrong, wrong and the opposition are right, right, right. I surely can't be the only person who would respect oppositions if they sometimes just agreed with some of what the government was doing. Not in total. They could of course suggest changes that might improve things (as almost always happens in committee quietly and gently aware from the glare of the camera and the microphone). But they could just sometimes say "Do you know what, we basically agree with this. Let's move on.". I would definitely respect them more if they did this. More importantly I would then be willing to give them a fairer hearing when they then strongly opposed something. The problem at the moment is that we face Mandy Rice-Davies syndrome. They would say that wouldn't they? So why should I be bothered to listen? I can't even be sure if they really believe what they are saying or if they are just opposing for opposition's sake. I should end by acknowledging that it is not just Labour who do this. The other parties are also as guilty of this sort of politicking. I did used to call for more measured debate when the Lib Dems were not in government but I recognise that my own party would sometimes play games like this. And as a result they did themselves a disservice. We always hear how politicians are trying to engage the public more in debates. They are failing at the moment. A different approach is surely worth a try? One of the best hours of radio I have heard in the last year came not from a radio station but actually via a podcast from "Talk About the Passion", a podcasting collective who make recordings about aspects of British culture of which they are passionate. The one that I enjoyed the most was from Tim Worthington and Ben Baker about the "Video Nasty" phenomenon. You can download it here. Anyone coming of age in the 1980s or older will remember the furore from the media and politicians about the fact that people could get hold of in some cases fairly dubious (but in lots of cases relatively harmless) videos. A list was compiled which became known as the Video Nasty list and attempts were made to ban them from sale. I certainly remember the coverage and I also remember watching a few somewhat dodgy vids myself around that time procured from "Dave's Video Van" that used to do the rounds in Runcorn, the town I grew up in. However I never really knew all the details but Tim's encyclopedic knowledge of the subject coupled with Ben's enthusiastic presenting style (and to be fair he seems to know a fair bit about the subject too) makes for a fascinating listen. The way Tim puts certain things into context too that totally hit the nail on the head is noteworthy too. For example he goes into detail about how jarring it was to go from the end credits to a screen of black and white snow and often by the time you had finished the film at night time there were no channels broadcasting during the '80s which made the end of the watching experience somewhat eerie. There is also lots and lots of detail about the political machinations around the whole Nasty episode and an informative description of how one of the trials trying to prosecute a distributor spectacularly collapsed as the judge essentially accused the Attorney General of having wasted public money. If you are interested at all in 1980s popular culture I highly recommend listening to this excellent analysis of one of the most memorable moral panics this country has ever witnessed. "Ed Miliband praising Thatcher is the equivalent of telling Labour supporters to f**k off". I thought this was rather odd and as I read the piece in the Telegraph Owen was referring to I could not see "praise" as such. Instead Miliband was paying tribute to how she created an era of aspiration which is surely pretty uncontroversial. He was sent a quote by a source who turned out to have been wrong. Fair enough a few minutes later he corrected himself. Almost at that very same moment, Owen was on Radio 5 laying into Kelvin MacKenzie for having published the Hillsborough piece without verifying that his sources were accurate. I totally agree with Owen that MacKenzie is a vile individual who deserves to be vilified for what he did. But if I was Owen, I'd be a little bit more careful about checking what my own sources are sending me before flying off the handle with vituperative tweets. He wouldn't want to get a reputation for in any way acting like the former Sun editor. 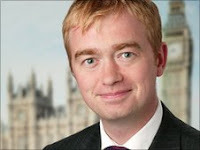 There is a small head of steam building up behind the idea that Tim Farron should not be returned to the position of Lib Dem President unopposed in the incipient round of internal party elections. Tim has been a great President in my view. He (usually) gets the tone right on issues and he is an excellent media performer. He is also very good at engaging with the party grass-roots both in face-to-face and online fora. No matter how good someone is in a position, even if they are the likely winner (as I suspect Tim would be even if challenged) it can only help to make them raise their game further, to ensure their views on issues are made clear and where necessary challenged. An election such as this is a good opportunity for other people in the party to raise their profile, both internally with members but also more widely. The party is in government so who fills this position has wider consequences as they will be presiding over a party that has executive power. For this reason there will be heavier coverage of this than in elections before 2010. I think it is a chance for someone who is not and has not previously been a parliamentarian to have a shot. My gut tells me it would be better if the winner was not a current or former MP or peer (although in practice this has never happened since the current party's formation in 1988). We have lots of talent within the party and it would be a chance for some of that to shine through. For example strong campaigners who just missed out on winning seats in previous elections such as Bridget Fox, Katy Gordon and Ed Fordham amongst many others would be worthy candidates. But perhaps most important of all we are the Liberal Democrats!. For a position as important as party President it simply doesn't look good for someone to walk into the job without an election, no matter how good they have been. Boris Johnson said: “I barely understand it, but information will spout unstoppably from these gizmos.” - Genius! As some of you will know our 9 1/2 month old baby Oliver died in July. My wife's cousin, Tim and two of his friends are running a Triathlon this Sunday and are very kindly raising money for the Friends of PICU, a charity that raises funds to help with equipment, staff and other things like toys for critically ill children in Southampton PICU. Olly spent several weeks in that unit and we were very grateful for all the help and support we were given some of which was funded by this charity. So if you are able to we would very much appreciate it if you could make a small donation to the efforts of Tim and his friends which will go towards helping other families who are currently in a similar situation to that which we have experienced in the last year. Is the fact that the party was advertised on Facebook relevant? - A terrible tragedy but I'm failing to see how the Facebook part of it is relevant. When parties were organised using Royal Mail and someone was stabbed outside one the Post Office wasn't an integral part of the investigation. C4′s Gary Gibbon: Tory plots against Cameron continue - Heard it all before. Brown was always given "a few more months"
Looks like Dan Poulter, the new health minister may have hugely exagerrated his working hours when a junior doctor. There was a fascinating poll published in The Guardian this weekend showing that 77% of MPs do not think current drugs policy is working but that only 31% of them would consider relaxing the current laws. This was done in secret of course. Had they been on the record I suspect far fewer would have put their heads above the parapet. "...The problem is that the media would refuse to support a law that would rob them of easy front page headlines: you can't really print a story based on the stigma of drug use if those drugs aren't so taboo. Sure, abuse would still make headlines, but if smoking a joint or sniffing coke or taking a few pills is seen as on a par as having a pint, or a smoke, it becomes less of an issue...."
Leveson has shown just how amoral newspapers can be in their pursuit of stories that will guarantee sales. Time and again we have seen that increasing circulation takes priority over any sort of propriety. We saw it again recently with the Sun's decision to publish photos of Prince Harry naked whilst on holiday and supposedly in private. There was no public interest in these, they simply helped increase circulation briefly. I actually wrote a piece about the amorality of The Daily Mail a few years ago regarding their approach to campaigning on the HPV vaccine. They campaigned against it in England, and for it in Ireland. The same vaccine. The same newspaper. Two opposing campaigns. The only rationale that makes any sense regarding this is that they must have thought an anti-campaign here would sell more papers but that a pro-campaign in Ireland would serve the same ends. That is completely and totally amoral. Playing with the health of young girls for financial gain. There must surely be a fair bit of truth in Craig's comment. Of course if drugs were legal then all those tabloid splashes about some or other pop star snorting cocaine and the "My Drugs Hell" confessionals would be less marketable. They'd still shift copy of course, problems with the legal drug alcohol still does but drugs have an extra cachet because the frisson of their illegality. Ironically this same sort of frisson is one of the things that can perversely encourage young people to try drugs in the first place as an old friend of mine reminded me this weekend. The fact that so many MPs can (privately) acknowledge our current drugs laws are failing and yet simultaneously refuse to engage fully with the debate about what to do to improve the situation shows what a mess we are in. The salacious tabloid agenda surely has to take a fair bit of the blame for this. Any politician openly voicing these concerns is shot down by those exact same newspapers that profit so heavily from the status quo. It doesn't take a genius to see why that should be the case. Do we have to be so macho? The UK's attitude to computer education needs a reboot - This. Oh so much this. The blogpost I was pretty much going to write myself on why Nick Harvey should not have been knighted - Stephen Tall saved me the job! 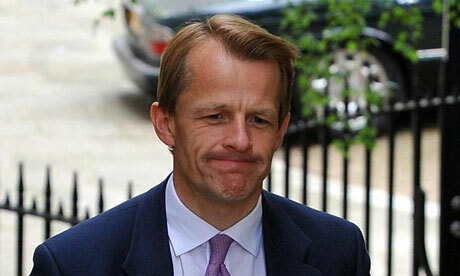 So David Laws is reportedly back in the government as an education minister. OK, it's not a cabinet role but in my view it is a well deserved return for one of the Lib Dem's best MPs. I had initially thought the discussion was going to be more wide-ranging but it became clear quickly that the focus was solely on David Laws and with particular focus on the reasons why he left the cabinet in the first place in May 2010. Both Peter and Julia were of the opinion that he should not return. Julia seemed to think that really he should never be allowed back into public office. Peter was more nuanced and accepted that David's motives were to protect his privacy rather than for financial gain but that he needed to have subjected himself to the voters once more before returning to office (in the same way that Cecil Parkinson did in the 1980s and also David Blunkett did in 2005, although he acknowledged that this convention has not always been followed e.g. Mandelson). I tried to argue that David claimed in the way he did in order to protect the fact of his sexuality. Julia did not accept this and even went so far as to agree with a caller later on who used the term "thief" when describing him. I just simply think this is not right. I will try and explain why. When David Laws first moved into the house for which he made the claims, the person he rented the house off was his landlord. There was nothing wrong with him claiming at that time. At some point in the next few years he began a relationship with his landlord. At first this was OK as well but in 2006 a new rule was brought in which meant that MPs were not allowed to claim through this mechanism if the person they were paying was their partner. It is from this point onwards that the fact that he continued to claim was a breach of the rules. It is worth pointing out that there is another legitimate mechanism through which David could have claimed if he had declared that his landlord was his partner and would have been entitled to even more than he actually claimed. But of course if he had done this he would have been outing himself. David was not out at the time and did not wish to be for his own personal reasons*. So he decided not to use this other mechanism. I have seen people also say that he could have simply stopped claiming. That is indeed true, he could have done. But the big, big problem then is that suddenly, when the rules about partners change he would have instantly stopped claiming. He might as well have painted a big sign outside his house saying "I am in a relationship with my landlord.". I fully expect that several tabloid newspapers would have taken this as a green light to publish stories to out David Laws. The inquiry into David's conduct agreed that he was motivated by his wish to protect his privacy. He was in a no-win situation after his circumstances and then the rules changed in 2006. It is clear that he was in breach of the rules. He resigned and paid back the money. He has been on the back benches for nearly two and a half years. I think the fact that he could have claimed more through a different mechanism speaks volumes about what was really going on here. I know some people will never be persuaded but I really would be saying this if it was an MP of any party in the situation. I welcome the reappointment of David Laws to the government. *Julia repeatedly said on the radio yesterday that she could not understand why someone in this day and age would want to protect their privacy about their sexuality. With all due respect, Julia does not have direct insight into the pressures individual people can be under from e.g. family and friends. Just because the circles she moves in are accepting does not mean everyone else is and it is not up to any of us to judge who should and shouldn't reveal private details about this facet of their lives. Now that the dust has settled a little bit on the NHS reforms I have a request. I tried to pay close attention to the detail of what the changes mean as the bill was going through parliament. Lord knows we had enough coverage at the time (although there was often much more heat than light I fear). As far as I can tell the changes are fairly modest and essentially involve more devolution of power to local GP practices and some extension of private providers running NHS services (which was also done by previous administrations). Everything that was free at the point of use before will still be free at the point of use and again as far as I can tell the NHS budget has been protected (albeit there will be some efficiency savings with the money ploughed back into the NHS budget). So, can someone please tell me, with links to evidence, how the NHS is being "abolished" or "destroyed". I have seen many people claim this, often Labour activists but I have never seen proof of it, or even a convincing prima facie case. Just in case anyone here thinks I am being provocative, I am not. I am genuinely asking. I am a member of one of the parties in government in this country and if I really thought that my government had enacted a bill that would end the NHS and free at the point of use healthcare, I would leave the party and vigorously campaign against it. So I am appealing for someone to prove to me that these claims about the NHS being destroyed are true. Pot and IQ - A Flawed Debate - Yes, yes, 1000 times yes! So Apple have managed to successfully enforce patents for smooth scrolling and double tapping - Is that really right?